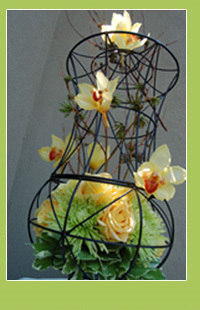 Founded in 2001, Grandiflora creates elegant floral designs that fully express the sentiments and characteristics that are unique to each client. Calling on her discerning eye and artistry, Principal Designer Karen Hsu draws her inspiration from her training in ikebana, the ancient Japanese art of floral arrangement that emphasizes sculptural composition in design. She further applies her architectural training and her sense of spatial balance toward floral creations that accurately convey the client’s vision. Together these elements define and embody the design philosophy of Grandiflora: a signature style that combines timeless design with a modern sensibility. Whether your event is petite or grand, at Grandiflora we believe that details make the difference. From your first consultation to the event day, we will make your special occasion uniquely yours.